You are here: Home / Featured Articles / Is Your Multivitamin Supplement a Multi-Waste of Your Money? After years of being ignored, gut health is finally getting some well-needed attention. Many health-conscious people now understand the difference between “good” and “bad” gut bacteria, and how critical it is to keep to keep their digestive system in tip-top shape. After all, a healthy digestive system is essential for building immunity, regulating appetite, managing stress, and much more. One tool that you may not have heard of in relation to achieving (and maintaining) a healthy gut is fulvic acid. Fulvic acid is typically extracted from humic deposits, which are very rare and are believed to have been created from ancient lush vegetation by microbial activity near the surface of the Earth. In its natural state, fulvic acid enables plants to absorb and use minerals and other nutrients very efficiently. In fact, it is absolutely essential for plant health. Fulvic acid contains a vast number of naturally occurring bioactive substances. These include supercharged antioxidants, free-radical scavengers, powerful detoxifying enzymes known as superoxide dismutases (SOD), nutrients, hormones, amino acids, natural antibiotics, natural antivirals, and natural fungicides. Abnormal gut permeability – a condition in which food and other particles are able to penetrate the gut lining and enter the bloodstream where they shouldn’t normally be – is known to lead to inflammation and cause multiple health problems. Consumption of fulvic acid has been shown to reduce the incidence of digestive disorders such as SIBO (small intestine bacterial overgrowth) and inflammatory bowel disorders. It also helps with reducing constipation, bloating, diarrhea, and food sensitivities. There’s an ancient natural remedy found mainly in the Himalayas known as “Shilajit.” It has been used for hundreds of years in traditional Indian Ayurvedic medicine to treat health problems that likely have poor digestive and immune health as underlying causes. Just like humic deposits where fulvic acid comes from, Shilajit is also believed to be formed over centuries by the gradual decomposition of certain plants by microorganisms. Shilajit contains 60-80% of fulvic and humic acids. Its biological effects are to a large extent attributable to these acids acting as carriers for bioactive molecules by forming complexes with them. Can Fulvic Acid Help Prevent Alzheimer’s Disease? According to a 2011 study published in the Journal of Alzheimer’s Disease, a combination of its antioxidant and nutraceutical properties may potentially enable fulvic acid to protect us against diseases such as dementia and Alzheimer’s disease. A well-known contributing factor to the development of such so-called “cognitive” disorders is free radical damage in brain cells. Fulvic acid is a proven powerful antioxidant that is known to protect cells and their internal structures from harmful oxidation and breakdown by free radicals. Specifically for dementia and Alzheimer’s disease, the abnormal processing of a brain cell protein called tau into insoluble filaments is believed to be a critical step in their development. This study showed that, in a laboratory setting, fulvic acid counteracts specific aspects of abnormal tau processing by reducing the length of insoluble tau filaments and even disassembling them after they have been formed. These encouraging results led the researchers to conclude that fulvic acid is likely to provide new insights into the development of potential natural treatments for Alzheimer’s disease and possibly other dementias as well. According to a different 2011 study, fulvic acid supplementation significantly improved the symptoms associated with eczema, even when compared to other eczema treatments. In fact, fulvic and humic acid protect the skin on topical application and appear to help in treating wounds, scratches, and rashes. Fulvic acid has also traditionally been used as a remedy for poison ivy, poison oak, and athlete’s foot. Should You Take Fulvic Acid Supplements? Our health is constantly being attacked by thousands of chemical pollutants – be it antibiotics, allopathic drugs, hand sanitizers and detergents, even household cleaning agents and deodorants. Thanks to modern farming practices, our soils have been contaminated by industrial pollution, pesticides, and chemical fertilizers. These not only endanger our health, but also contribute to soil erosion and nutrient depletion. As a result, we have fewer nutrients in our food. And the nutrients we still have are in lesser quantities than they were years ago. This, along with a reduced ability to properly use even what is available, is weakening our immune systems and making us more vulnerable to infections and diseases. 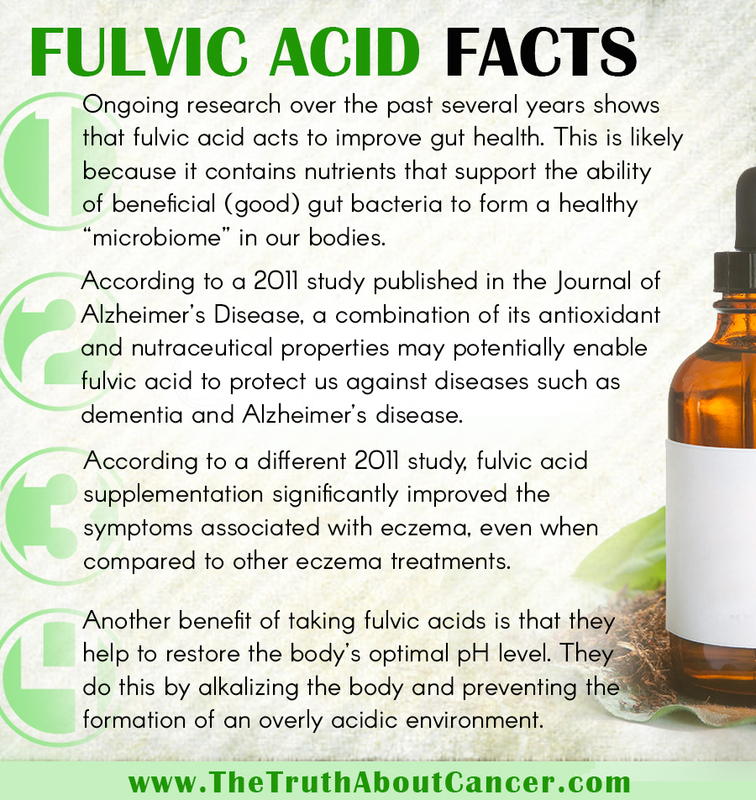 For all these reasons, fulvic acid supplements are highly recommended as a regular nutritional aid for multiple reasons. As we have already seen, fulvic acid improves gut health, boosting the immune system and lowering the risk of many digestive disorders. Additionally, fulvic acid is now actively being considered as a potential future treatment for Alzheimer’s disease. There are also many other benefits of taking fulvic acid supplements. For example, fulvic acid is an excellent natural chelator. This means it binds easily to nutrients, minerals, and metals to form stable, water-soluble complexes. This in turn enables our bodies to absorb the nutrients, instead of having them pass through us. Another benefit of taking fulvic acids is that they help to restore the body’s optimal pH level. They do this by alkalizing the body and preventing the formation of an overly acidic environment. In doing so fulvic acids help to prevent long-term illnesses and improve our body’s defenses against harmful bacteria, fungi, yeast, and other infectious organisms. People taking fulvic acid have also reported a noticeable improvement in their energy levels, which is likely due to better detoxification as well as reduced inflammation and free radical damage. Fulvic acid is a naturally occurring organic product and completely non-toxic. However, you should always consult a qualified health professional before taking any supplements to ensure that they don’t interfere with any other ongoing treatments or medications. 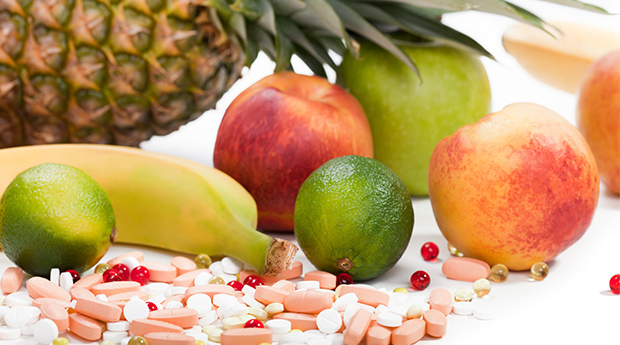 The Truth About Vitamins in Nutritional Supplements. Natural vitamins may be superior to synthetic ones. ORAC Values of Fruits and Vegetables. Vitamin C as an antioxidant: evaluation of its role in disease prevention. Beta-carotene: a cancer chemopreventive agent or a co-carcinogen? Comparison of the bioavailability of natural palm oil carotenoids and synthetic beta-carotene in humans. Oxidative changes associated with beta-carotene and alpha-tocopherol enrichment of human low-density lipoproteins. Nutri-Con: The Truth About Vitamins & Supplements. The Truth About Natural vs. Synthetic Supplements. I have been taking vitamins from Puritans Pride. I would like your opinion on that brand. I take the Usana vitamins, have for years. Also have tried many other brands and I have always found that I feel the best when I stick with the Usana’s vitamins. As a holistic public health RN health coach in private practice, public speaker, author and broadcaster, it is important that I consistently express certain facts to large numbers of people. Fact 1: Our food supply is slowly poisoning us and is causing cancer and autoimmune diseases in record amounts, thanks to Monsanto and the Feds. Fact 2: We must eat at least 7-13 servings of fresh, raw, organic fruits and veggies a day to neutralize oxidative stress (rusting inside) and cellular damage, and 15-20 servings if you want to repair (Who can do this?). Fact 3: Juicing is a good way to supplement but can be a hassle, expensive, messy and short term. Fact 4: isolated, mega-dose vitamins and multivitamins are causing more harm than good in high risk individuals (“CARET Study” out of Fred Hutchinson Cancer Research Center began the research back in the 1980’s showing 17% more death and 28% more lung cancer in the vitamin group compared to the placebo group after only 7 years). Fact 5: It is important to supplement our diets with whole food nutrition. Because I can’t possibly eat enough fruit and veg to do the job, I chose to add whole food concentrates, fruits and vegetable juice powders in capsule form to my diet 15 years ago. Juice Plus is my supplement to take every day and I educate the world about it. It is an easy solution and eliminates all of the risks associated with isolated vitamins. It’s NSF certified, Non-GMO, kosher, passes GMP, and has 36 independent published research studies backing up its safety and efficacy. Hey Amreen here, can I get little time of yours to knw know more of supplementation. New Chapter is an excellent organic and non-GMO multi-vitamin/mineral that I’ve been taking successfully for two years. They are available at most natural food stores. Let me know what kind of food a cancer patient avoid for better health. The ultra-safety of supplements compared to drugs, as dangerous as war. I love and get all of my supplements from Seeking Health. I’ve had great results, and they made for those of us with the MTHFR mutation- check them out. I know everyone has their favorites but what do you look for in a vitamin and the company that distributes them? I look for published clinical research done on the product and done by their scientist and I say published.. that research is expensive to do so companies do not do it many times. The do copy cat studies.. not their own. I also look for a company that tests their raw materials with several hundreds of tests for pollutants and doesn’t trust their vendors. This is what I look for and I just wrote another company called Perque and still no reply.. imagine that. We have written several hundred and asked those questions and never once have we gotten back a useful answer. try it. I did write one company and they did have a qualified answer. They had 125 published manuscripts on their products and ran over 300 tests on the raw material batches looking for pollutants. That is what I was taught to ask about 30 years ago and it still hold true today.. The label means nothing! I have been taking USANA vit for 5 years and have felt better than when I was taking whole food vit. USANA is an all green company. They manufacture and package their vit themselves in the Utah. There is no middle man. 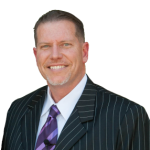 Dr Myron Wenz is the founder of the company and a brilliant man. He has 11 scientists on staff. You can go to their web site and ask them questions. These vits work synergistically with each other and are highly absorbable. There is no vit after taste when burping and they are easy to swallow. Other vits I have tried have gotten stuck in my throat. They have a health pack you can pick and choose which vits you want and they package them in single packs for you to take in a.m and p.m. If you burp you maybe low in HCl and enzymes. Gluten may hurt stomach cells that make HCl (stomach acid). I take my supplements after a meal. See my other comments. Best wishes. Where’s the the most important mineral of all,magnesium? Yes…Mg may help 350 chemical reactions..,.,very important! Hi William, I just felt I wanted to reply to you (as someone who commented that the supplements promoted here were too expensive for us). Whilst I wholeheartedly agree with you that it is vitally important to switch to a whole food diet, please don’t assume that those of us who can’t afford the supplements aren’t doing that! It’s not a case of diverting funds from unhealthy habits – we spend £400-500 per month on whole foods (it’s just the 2 of us) and I believe it’s better to be eating well than having to divert funds from our food budget for a supplement. I also feel a bit weird about all the promotional products that seem to be advertised so frequently. It leaves me wondering how many times we will have to subscribe to yet another product (if we were to do that with everything on promotion) as the costs mount up and up? That is not to say that I am ungrateful for TTAC and all it stands for – I am absolutely in awe of Ty and his wife for all the information and research they’ve provided us with. I think they’re just amazing human beings. 23% of supplements may have hidden gluten so eating only organic food is better, but I need to take supplements. Without Vit A 10,000IU I can’t soak air into my lungs. Without 5000 mcg of biotin my MS kicks at 1 1/2 months. Folate supplement gives my toes more circulation. Vit B12 intrinsic factor/shot stops my hard crying and helps my fear/stress. Vit D3 5000IU helped stop my crying for no reason when the weather was gloomy. Coenyzme Q10 is the spark plug to the cells. Mg helps 350 chemical reactions and helps cramps etc. Zinc gave me 5X more energy and helps the immune system 2000mg of fish oil daily stopped my colds/flu for more than 20 years. Rhodiola helped raise oxygen in me /helps my adrenals. I would love to only do food, but I need the supplements. I can’t eat dairy…so I take Osteoprocare instead to help my bones etc. Do what works for you. I take LDN which is $1 a day which helps to heal my gut lining so nutrients absorb. . Lecithin defat my liver which helped my memory. I am glad supplement exist and pray they will always be available. I am not ok without them. Supplements can’t take the place of food which has undiscovered nutrients and combination of nutrients that heal a person, but I am they exist. People who need supplements maybe dealing with Celiac. Changing their diet to no gluten/dairy/soy/sugar/GMO may help and eating no food with a label and trying to avoid hidden gluten. It would be awesome if only healthy food was at a grocery store. A Health food store is better, but still I can’t eat things with a label/bag/box. I can’t have meat/coconut oil/saturated fat and monounsaturated fat/olive oil/heated oils/dehydrated food. I can’t have turmeric/resveratrol etc. so I eat what works for me and take supplements to help. I have severe gut issues and allergies I’m battling. I just CAN’T take many of the plant-based vitamins or eat the rainbow. Now what are people like me supposed to do? Allow me to provide some direction for your situation. Are you open to that? Gut issues/allergies can be due to Celiac. Tests may not work to diagnose it. Cyrex labs may help. Below is what I do for my Celiac. Best wishes. No gluten/dairy/soy/sugar/GMO and vitamins/good oils, LDN and detoxing help me. Vit D3 5000IU, zinc 50mg if detoxing, 2000mg fish oil, 2000mg evening primrose oil. 2000 mg lecithin, Phosphatidylserine/DMAE, krill oil, CLA, Coenzyme Q10, Rhodiola, Mg citrate 400mg, Vit C, 5000mcg of biotin, Nature’s Plus- Source of life multiple, HCl and enzymes with meals, dairy free probiotic, Vit B12 methylcobalamin shot/spray/under the tongue kind/intrinsic factor kind, MTHF folate, coenyzme Q10, rhodiola, may help brain/body/thyroid/depression/immune system and more. Gluten is wheat/barley/rye/corn…oats has gluten with avenin…and there is a small amount of gluten in rice. GMO corn/soy/canola oil may hurt. Amour thyroid maybe needed since gluten may made antibodies to the thyroid. Coenzymated B vitamins far from synthetic kind make make me calm. Books: No grain No Pain, Wheat Belly, Grain Brain, Dangerous Grains and The Autoimmune Fix and more explain Celiac. Start eating fresh garlic daily. Cut the garlic up and let stand for 15 minutes or so. Sprinkle salt on it, put olive oil on it, let it stay a bit and then eat it. You will start to notice that many skin problems cease and that your blood pressure will go down. Make sure garlic is organic. You must use salt with it as otherwise, it is too harsh to just eat alone. I found out I had breast cancer, prob due to years of lack of vitamins my body couldn’t have from foods, it went terminal on my bones . I refused Chemo & all meds. I Stop processed food & sugars, I eat veg , salad , fruit, high dose vits ,supplements & eat healthy & exercise 15 mins a day on trampoline or a bike ride. .Get massages on area with organic oils. My mets on my spine have gone from 8 down to 3 so it works. Keep happy & positive . Most supplements are put out by the pharmaceutical companies who are trying to make a few dollars from those who don’t like pharma interests. Such supplements won’t work, and this helps to discredit them before the public. The study may not show the truth about the situation. Vitamins etc are good. There mega doses maybe extremely high to make it look like supplements are not good. Celiac people may get cancer due to low nutrients absorbed. They may change their diet, but still many need supplements to be ok. Thank you so much for this article. I never believed in supplements before as I have always been a big believer of eating a well balanced diet. Also, I think it had a lot to do with not knowing enough about what is a good supplement and what’s not. I tried in the past and never found a difference. As much as I still do advocate a balanced diet, it is not always the easiest thing to do and I’m not one to judge anyone who struggles with a healthy lifestyle especially in this day and age of everyone being so busy. Since I’m one of those busy people, I need to supplement and I finally found something that works! I have those days when I’m so busy that the only thing I consumed for the day is a coffee and a bag of cheezies. Yikes! Surprising enough, my supplements have helped me survive those crazy days. The supplements I take are exactly as you have described, all natural in it’s purest form and maximizes bioavailability. That’s very reassuring. It’s done wonders for me and the people I’ve introduced them to and I really don’t know what I’d do without them. I agree StaciJoy. If I had to eat all this food in the day to get the required amount of nutrients in my body, I won’t get anything done. Juicing and shakes may be quicker but I’ve been told by many that it gets boring…probably why it’s short term. 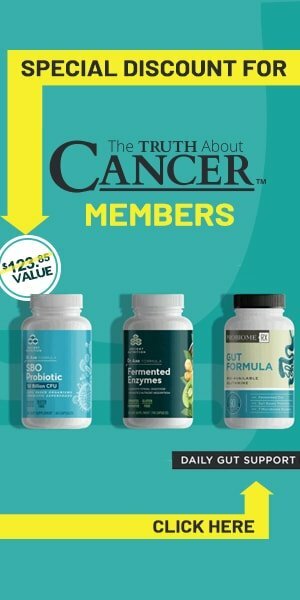 My 3 favorite vitamin and supplement company’s are Life Extension,Swanson and Vitacost.I only buy when these company’s have a great sales on a vitamin or supplement that I use regularly.Vitamins and supplements can be very pricey and one has to pay attention to there sales that these companies have get the best deals. As long as you are comparing apples to apples. The composition of comparing 2 different brands must be the same. Ty what supplements do you and your family take daily?? I am really surprised that no one in this conversation has mentioned MegaFood brand supplements. They are not the cheapest, but they appear to be about as close to real food supplements as one can get. http://www.puritan.com/megafood-brand-1342/ppmegafd-women-55-60tab-063684?scid=3763&cmp=gpl-_-multivitamins-_-063684&gclid=CK7D5Lz81dACFQMMaQodeocOoQ&noredirect=true&ssl=1 I could not have cruciferous family unless cooked…blocks thyroid and organic brown rice has arsenic and is gluten. It looks good. Can use LDN/gluten enzymes to help block low amounts of gluten. Each person needs to figure out what helps them the best. Dear Dr. Becker, l looked up Shaklee products. It was difficult to find the labels but when I did find one – guess what it said? – “Folate in the form of folic acid” They don’t know that folic acid is different from folate. Perhaps they want the consumer to be confused. Either way, Shaklee failed the test. You are probably one of those indestructible marvels who can eat anything (including synthetic folic acid) and still be bullet-proof. For those of us 40% of the population who have some form of MTHFR genetic SNP, (and maybe everybody for all I know) all that folic acid takes up the receptors meant for methylfolate and generates UMF unmethylated folic acid, which undermines your killer T cells – a good recipe for cancer. I hope you passed on your A+ genes. More information – look up Ben Lynch, MD – one of the best MTHFR experts – find him on You tube also. HIs company is SHEI. Janet – Are you interested in capsule form or powder form of a multi supplement? Why are you so down? I guess I would be if I was misled. PubMed and JAMA have both endorsed something that I know you haven’t heard about it. If you are interested, message me. There is hope for you!